Need some 80th birthday ideas? These 80th birthday gifts are unique gifts for seniors. 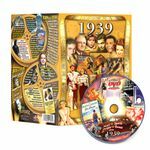 Many are 1939 themed gifts. Add those hard-to-find decorations. Let us give you helpful party ideas. Combine it with our gift basket to make a winning combination. another great 80th birthday idea is to do a then and now display of what things cost the year they were born, and on the other side of the poster board, you can show what they cost today. For example, the price of food then and now, gas and a house. If you need those facts our trivia booklet and magnets from that year provide that information. 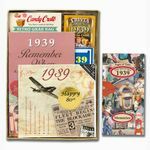 You can buy one of our 80th birthday frames and decorate it with shells, trinkets or something special and meaningful to the person you are giving it to. If they love traveling to the sea, hot glue some tiny shells to the frame to make a personalized gift. Your local craft store will have tiny items and supplies to help you out.